"Wreath-Laying in Poet's Corner, Westminster Abbey"
What can I say about the great writer whom we are gathered here to commemorate that is new, witty or informative or even interesting? After all, you will appreciate that I am not an academic so I can't offer you a Marxist viewpoint, certainly not a feminist one and not even a deconstructionist one. I'm not a biographer either so can't tell you about my latest book, full of such delicious new theories and completely free of any stuffy old evidence to support them. I'm not involved with the media so I can't tell you about camera angles on Dorothea. I am only someone who enjoys reading the novels of George Eliot, but I enjoy reading her ‘aloud and, like the Ancient Mariner, am inclined to stop one of three and bid them hear the tale. Sometimes this is a mutually voluntary event; more often, I must admit, I have been offered payment to stop. Since half these sums over the last twenty-five years have found their way to the coffers of the George Eliot Fellowship, they are in a healthier financial state than many other literary societies. I mention this only because it is as a recognition of my services that I find myself placed in the awkward spot. But it is only awkward because I feel myself unqualified to fill it. To say something suitable about the wonderful talent whose genius we all benefit from; I feel the genius but that is not enough. Since the Fellowship has put me in this uncomfortable position I will return the compliment for a moment. Over the years I have supported them in a number of projects to commemorate George Eliot, some of which I have been less than enthusiastic about but all of which they have felt - and they have been proved right - have raised her profile, even though most observers have agreed that George Eliot's profile is not her best feature - Savonarola, Dante - these have been among the kindest comparisons. Never, since her death, has she been held in such high esteem as now. All the same, the Fellowship knows that I have always wished that there was some memorial to her of a living nature. I would like to think that we might one day endow a George Eliot Novel Prize, or a short story award. It could be at a university or a school or somehow support a writer and help him or her produce something which, without our help, might not have existed. 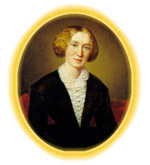 We want, after all, if not another George Eliot, a writer for our times, inspired and helped on by enthusiasm for George Eliot.